Don't Panic About Water Damage Cleanup - Branch Services Can Help! Flood damage cleanup can be difficult. We recommend calling a professional! With hurricanes like Katrina and Florence, much of the damage you hear about isn’t from the wind; it’s the water damage. While hurricanes aren’t always the cause, water damage emergencies happen all the time—be it from more common rain events, burst pipes, or even snowstorms. Ensuring that you have current flood insurance if you are in a flood-prone region is a crucial pre-emptive step you can take to help pay for damages should they occur. Another step you can take in advance is to make sure that you have a properly working sump pump. These pumps will help remove water from your basement before it has the chance to rise and enter your home, keeping the flood damage cleanup requirements to a minimum. Even if you’ve done everything possible in advance, floods still happen. When a flood hits, there are some important things to keep in mind, which will help you through anything from a flooded basement to a whole house full of water. The most important thing to remember in a flooding event is that a fast response is vital. The more quickly you can respond to a flood in your home or business, the more likely you are to mitigate some of the damage and lower the overall costs. Certain items—such as carpets, flooring, and upholstered furniture—must be replaced for a proper water damage cleanup. A professional water damage restoration and mold remediation company, such as Branch Services, will have experience dealing with insurance claims and will be able to deal with your insurance company for you to get reimbursement for items that cannot be cleaned. While dealing with small amounts of water damage, such as the kind that comes from a leaky pipe or a temporary water incident (think broken fish tanks! ), may seem like a DIY job. A property owner’s best course of action would be to contact a professional to be sure. What people may not realize when dealing with water damage is that just cleaning up the puddle you can see is likely not enough. Flood waters have a nasty habit of finding their way into nooks and crannies, behind molding, under wall coverings, behind fixed cabinetry, and more. All of these places are perfect environments for mold growth. Professionals will not only bring in industrial dehumidifiers but also air movers and ozone generators to prevent mold from taking hold of an area. Remember, mold is nothing to mess around with, and you’re better safe than sorry. If a water damage event occurs, call a pro quickly; 9 out of 10 times you’ll be glad you did! 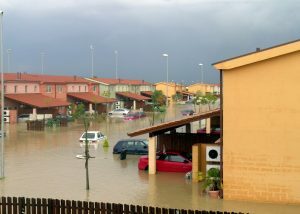 Flood damage cleanup can be a difficult process for an individual. Call Branch Services at (631)467-6600 for a professional flood damage cleanup!